Some dude came in today as I was leaving my commercial fill-in job to say he wanted a copy of his toric soft contact lens Rx so he could buy more contacts off the internet. Only one problem…it’s expired…by more than 6 months. Now, I know the national law says one year minimum, so how come Utah law states the following? commencement date, unless documented medical reasons require otherwise. Could it be that Utah is home to the most widely known Internet reseller and that they have deep pockets for paying off politicians? So, in the end I gave him a copy of his prescription, including the expiration date which has already passed. I wasn’t about to put my license on the line to extend an expiration without first evaluating the patient for myself. And Dude, do yourself a favor and get an eye exam to make sure the contacts aren’t doing any harm. After all, they are FDA-regulated medical devices. Do people go around to their psychiatrist expecting a refill on their meds without regular consultations to monitor their condition? 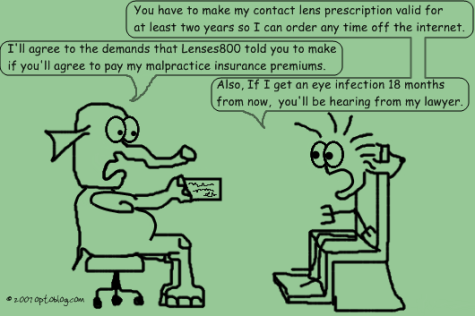 When you think about it, a lot could happen within just one year, so I think that’s more than fair to ask for regular contact lens follow up- especially the way I’ve seen individuals abuse their eyes through noncompliance with prescribed wearing time, replacement schedule, and lens care system. The bottom line is that I have the patient’s best eye health in mind, and the internet resellers with all their lobbying power just have their bottom line in mind.